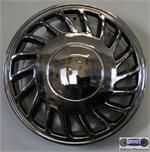 71636c, Hubcap COPY, 13", 52 SERIES, CHROME, 17 SPOKE WITH DARK GRAY POCKETS & NO LOGO. METAL CLIPS & WIRE RING. 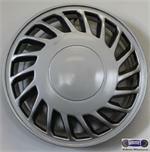 71636s, Hubcap COPY, 13", 52 SERIES, SILVER WITH DARK GRAY POCKETS, NO LOGO, METAL CLIPS & WIRE RING.